Dental Practice Management Software Market size is set to exceed USD 2.4 billion by 2024; according to a new research report by Global Market Insights. Rising prevalence of oral diseases including dental caries and periodontal diseases across the globe poses a huge healthcare burden. This is attributable to demographic changes such as rising elderly patient pool suffering from such diseases. According to oral health report by the U.S. Surgeon General, around 25% of people aged 65-74 years have severe periodontal disease that will augment the demand for dental practice management software in future. Increasing focus on oral health and rising awareness among the elderly patient pool will drive the global dental practice management market growth. Additionally, favorable government initiatives conducted by various organizations such as American Dental Association to increase awareness regarding the importance of maintaining oral health will favor market growth. Rising investments by venture capital firms along with government regulations encouraging adoption of various healthcare IT solutions such as electronic medical records, patient management and practice management solutions will fuel industry expansion. Development of cloud-based solutions along with the integration of dental imaging software into practice management software is a technological breakthrough that is set to drive the market growth. However, lack of skilled IT professionals across the globe to deliver software support and services will hamper business growth. Scheduling business segment dominated the DPMS market in 2017 and will witness robust growth over the coming few years. Rising elderly patient pool suffering from oral diseases will increase dental check-ups and visits, thereby propelling segmental growth. Invoice/billing software business is predicted to witness significant CAGR of 11.6% owing to its advantages such as automatic record of payments and billings, ease of payment, reduced paper entry data work, filing dental claims and increasing efficiency of processes. Additionally, development of innovative software for easy invoicing and billing process by the key industry players will stimulate segmental growth. Web-based software business segment dominated the DPMS market in 2017, followed by on-premise solutions. Development of on-premise dental office practice management system by industry players allowing clinical paperless charting, patient scheduling and billing/accounting applications will favor industry growth. However, on-premise segment is expected to lose its revenue share to cloud-based delivery mode owing to cost-effectiveness and operational efficiency offered by these advanced solutions. U.S. market held over 35% of global revenue share in 2017. Soaring adoption rates of DPMS due to expansion in healthcare IT should drive industry growth. Rapid technological innovations and increased government funding will further boost market growth over the projection years. UK dental practice management software market was valued over USD 75 million in 2017 and is anticipated to witness significant growth owing to rising geriatric population and favorable government initiatives to raise oral hygiene awareness. 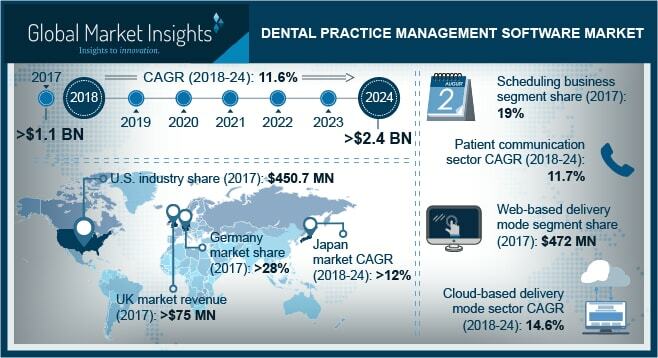 Japan dental practice management software market should grow at significant rate of over 12% owing to presence of geriatric population with oral problems coupled with greater oral health awareness among the patient pool. Some of the key industry players operating in global dental practice management software market are Patterson Dental, Henry Schein, Carestream Dental, Quality Systems and Curve Dental. The industry players resort to new product launch, distribution and marketing, mergers and acquisitions, and agreements and partnerships as their major strategies to stay ahead in the highly competitive market. For instance, in April 2015, Henry Schein launched upgraded version of its Dentrix G6 software. This upgraded software will offer customers new features that enhance the user experience and enables dentists to adopt paperless practices.